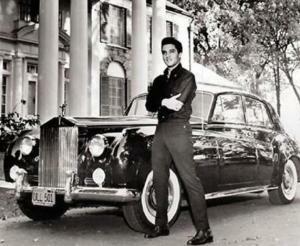 A car garage in Lancashire has just handed over the key of a brand new car to none other than Elvis Presley. Or rather, an Elvis Presley, at least. The customer, who has changed his name by deed poll and tours the UK as one of the nation's finest impersonators of the music icon, returned to Lancashire Ford on Hayfield Road in Ormskirk for the third time and on this occasion Elvis left the building in a shiny new Ford Mondeo. Whether dealing with rock 'n' roll royalty or just someone who likes a bit of karaoke down the pub, it is important that car dealerships and garages, like any customer facing business, has public liability cover. Included within a company's combined motor trade insurance policy, public liability cover provides financial protection to a business in case a customer should slip in their blue suede shoes and suffer an injury while on the premises. Brian Monahan, the sales manager at the dealership, told the Southport Visiter: "We all love Elvis in the showroom, he's been in a few times before and has bought at least two cars from us in the past. "He's just bought a brand new Ford Mondeo Titanium and walked away delighted with his choice... I believe he's just bought a Cadillac as well to go alongside his Ford. "He'll always be welcome, he's a great character."